One of the best parts of traveling besides the trip itself is taking home a souvenir to remember the adventure. It is a given that you are going to take a million pictures. However, when buying souvenirs it can get expensive especially if you are buying for family and friends. I am going to share with you my top three souvenirs that I look forward to getting when I travel. 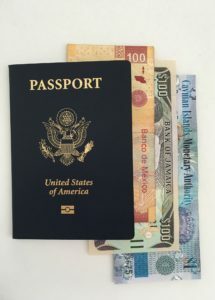 You use a passport as a form of ID when traveling but it can also be considered a souvenir. I look forward to getting a stamp everywhere that I go when I travel. It literally keeps a record of my travels and when I look through it, I am reminded of the adventures that I have had at each location and I look forward to where I will go next. Ever since I can remember I have always collected coins. When I started traveling I began to collect bills as well. I think it is very interesting that every country has a different form of currency. A different size, color, hologram etc. I look forward to learning who is on the face of the bill (president, monarch, and or prime minister) and if there is a country motto listed on it the story behind it. At times you can find the countries coat of arms or seal on the currency and it can give you some insight into the history of the country. I’ve collected currency from Canada, the Dominican Republic, and other countries. Yes. You read that right I said an Ornament. One day as I was shopping in a souvenir shop I came across an ornament that I really liked. It dawned on me that I could purchase an ornament on all of my trips and when the holidays came around I could decorate my Christmas tree with them. This would be a cute and fun way to reminisce of travels. While at the same time remind me going into the new year to continue to travel. 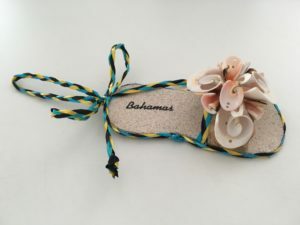 The ornament that you see below, is of a sandal with a the word Bahamas written on the sole. This is not to say that I do not buy other souvenirs when I am traveling. But I do keep the dust collectors to a minimum. I only buy pieces that really stand out to me and that I truly love. I hope you enjoyed reading this blog post. If you have any questions feel free to comment down below.